I was recently sent a weighted blanket by CMFRT to try out. I chose the 12 lb blanket. The rule of thumb is 10% of your body weight. I figured my kids could try it also. When I tell people about a weighted blanket they automatically think it’s going to be hot and you will sweat. Oddly enough it didn’t make me hot at all. 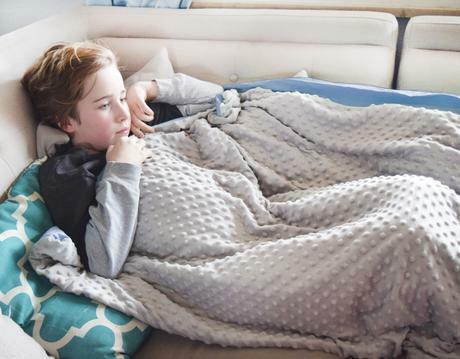 There are many reasons why a weighted blanket is something that some people should use. According to their website weighted blankets help with everything below. Reduce symptoms of other sensory and sleep disorders including Insomnia, Anxiety, Panic attacks, Autism, Restless leg syndrome and others.